Borna Barisic has admitted there is an atmosphere of despondency around Ibrox just now after Rangers’ recent poor run of form. The Croatian international is preparing for his side’s opening Euro 2020 qualifier against Azerbaijan on Thursday. Barisic has endured an injury-hit first season since his £2.2 million move from Osijek in the summer and former Light Blues striker Kris Boyd even suggested the left back didn’t want to be at Ibrox. And the defender admits the Ibrox side’s recent run of four games without a win has taken its toll. 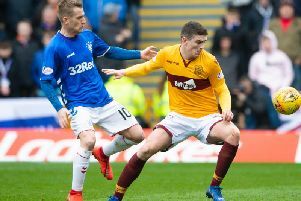 He said: “Rangers are a massive club with huge expectations, but the last few matches we have not been at the standard required at Rangers so the atmosphere around the club is sad. “We got knocked out of the Cup and we really wanted to get to the Final. And the 26-year-old is desperate to add to his four caps he’s won for his country this week. He said: “If I get the chance against Azerbaijan, I want to take it and keep my place in the team.